Moon Pandora - Solar System Planets And Moons Section. Pandora moving through Saturn's F ring. Moon Pandora moving through Saturn's ring. In this photograph taken by Cassini, you can see the faint Moon Pandora moving through Saturn's F ring. As a shepherd moon, Pandora and its partner Prometheus confine and shape the main F ring with its gravity. Pandora is 84 kilometers (52 miles) across. 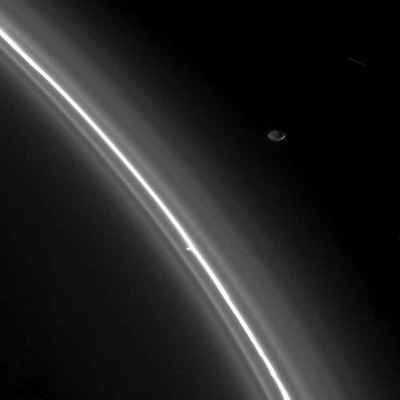 This image was taken on August 2, 2005, when Cassini was approximately 610,000 kilometers (379,000 miles) from Pandora. Building Life from Star-Stuff. Astrobiology. There's a long chain of events that led from the collapse of our local cloud of gas and dust to the evolution of life here on Earth. Exactly how each of these steps unfolded is still a bit of a mystery, but scientists know that a few atomic combinations were necessary: water, and organic compounds containing carbon. Dying stars are the source for this carbon, which they belch out, creating a kind of carbon soot. From there, this soot is blasted by intense radiation to create more than 100 different molecules, including fatty acids and simple sugars.